“Taking the Stone” is far from a fan or production team favorite, and on the one hand, I can understand why. It can be very hazy and difficult to follow. It took me quite a few times through until I was able to more fully grasp what was going on regarding the “taking the stone” ritual, and even at that, I had to connect many of the pieces for myself, and I’m not sure if they fully add up. And while I don’t actually think television that makes the viewer work to put everything together is a bad thing at all, there is arguably a bit too much ambiguity in this one. On the other hand, the lack of complete clarity also feels right to me. It feels largely run on dream logic and imagery, from the concept of someone literally holding herself afloat in midair through singing, to the girl with the see-through pregnancy belly, and to me that surreal atmosphere is meant to symbolically reflect Chiana’s state of mind–that strange state of hyperreality and confusion that someone experiences when a loved one dies. It’s that rare form of scifi driven more by psychology than by rules or technobabble and what it lacks in full coherence it makes up for in emotional truth. It’s not Farscape at its best but it’s brave, daring, experimental, and often brilliant in its weirdness. I also have to mention the wonderful little comedic subplot in which Rygel steals a bunch of items from the graves on the planet in order to adorn his room, only to discover that they seem to have a curse on them, something which he first ignores–in a great subversion from the norm, when he finds a strange, sluglike/wormy creature oozing out of the eye of a tribal mask, he simply says, “Bonus!” and snacks on it–but finally can’t deny anymore when it nearly costs him his life. It functions as a nice relief from the heaviness of the episode’s main plot while also maintaining its surreal nature, via what seems to be another instance of real magic in the Farscape universe. When people talk about Farscape being unlike any other scifi show in television history, “Crackers Don’t Matter” is one of the prime examples that they’re thinking of. 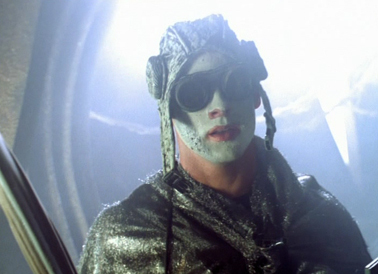 A loony, totally out-there mind-frell of an episode that paved the way for many similarly kooky installments to come, this wonderful, sincerely messed-up entry in the Farscape canon takes the more zany, stylistically experimental nature of earlier ones such as “Through the Looking Glass” and marries it to the genuine darkness of which the show was proving itself increasingly capable by this point, resulting in an utter madhouse of an hour that manages to be both whimsically and savagely funny simultaneously, indulging in silly slapstick, wordplay, and an at-times-Pythonesque sense of humor while also being truly, deliberately, and even uncomfortably dark, any given scene managing to provoke laughs and shivers at once. I can’t think of any other series that ever succeeded in producing a “comedy episode”–Farscape‘s first–with such a genuine underpinning of menace, while also being almost entirely character and actor-driven. Although deliberately off-kilter, surreal camera moves and music contribute to the atmosphere, the tension and the laughter in the air almost solely derive from the performances, in an episode that realizes that the most potent humor can come from the most unsettling places. For such a strange episode, its concept is actually surprisingly straightforward: T’raltixx, an odd alien creature, boards Moya, claiming to be capable of installing a device that will render the ship invisible and undetectable to all Peacekeeper scans, when his actual goal is to turn the entire crew against each other, driving them to kill one another so he can steal the Leviathan, which he requires for her bioluminescent abilities, as his species thrives on intense light, which further increases their powers of manipulation. It’s not exactly clear how his power works although it seems that mere proximity to him causes people to behave irrationally and to give into their basest instincts, and that is exactly what happens aboard Moya. As the crew’s mental health begins to devolve, they each grow more and more paranoid, forging alliances and then stabbing each other in the backs, all in the interest of staying alive. The crackers of the title are literal. They refer to the only food that Chiana and Aeryn were able to bring on board from the last planet after they discovered wanted beacons from Scorpius all over the planet, and they become a focal point of the characters’ madness, all of them afraid that the others are going to eat all of the food. One of the most interesting aspects of the episode is that, in many ways, it is a dark mirror to how the characters treated each other in the first season but dialed up to 11. Although they were rarely all at each other’s throats to the extent of, say, what happened in “DNA Mad Scientist,” early Farscape was practically defined by the fact that the crew members weren’t all warm and fuzzy towards each other. They each had their own agendas and didn’t have a sense of group cohesion other than when it directly benefitted them. Early on, they wouldn’t ever stick their necks out for one another and would never choose the others over themselves and their own personal happiness. But over the course of the season, they all very gradually softened towards one another until they grew into a real family. “Crackers Don’t Matter,” however, creates a scenario in which they are all more at odds than they have ever been before, all hyperbolic, intensified representations of the worst versions of themselves imaginable–all subsumed by their least likable traits and darkest thoughts. Again, it’s like a darker, scarier funhouse mirror version of the first season, in which the characters don’t only not trust each other, but their feelings and actions range from the violent to the potentially murderous. That doesn’t mean, however, that these are simply more honest versions of the characters with no societal constraints holding back their real feelings. They’re more made up of the sorts of nasty thoughts everyone has from time to time and only fleetingly entertains at a passing moment of annoyance or anger, which they would never legitimately consider or act upon, because they don’t actually believe them to be true or want to behave that way. T’raltixx amps up these feelings and pushes them outwards. And some of these feelings are very dark, indeed. In the episode’s first moment of shocking violence, what begins as a potentially funny scene of D’Argo and Rygel squabbling over crackers culminates in the relatively huge Luxan picking up the tiny Hynerian, slamming him down on the table, and acting on all the frustration he’s ever felt regarding Rygel’s greed and gluttony, force-feeding him piles of crackers to the point that the little guy nearly chokes to death. The only other time we’d seen Rygel being manhandled and tortured to this degree, it was at the hands of the insane Durka, which truly says something about how far D’Argo’s gone.